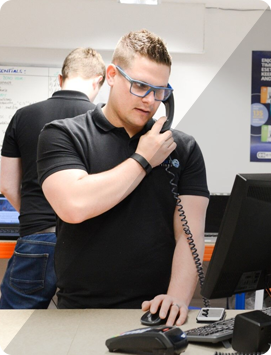 We’re always on hand to help when you need IT support, whether at work or home. Get in touch to resolve your IT issues now. Love it or loathe it, computer technology is a vital part of your business and as such needs to be working for you, not against you. In the course of our working week we see many businesses struggling with issues that not only slow down their workflow but are having a direct impact on their bottom line. Our role is to ensure your computer network is unseen, in other words you use it without thinking (or worrying) about it – it just works. Consider for one moment the peace of mind associated with having a network that is secure, fast and fully backed up, where everything “talks” to each other in a way that truly serves your business.